Having had the privilege this week of participating in the United States Study Centre’s Alliance 21 workshop, I’ve had a good chance to think about the fundamentals of the alliance, and why Australians consistently value it highly. At one level that’s not too hard to understand. As Mark Thomson has pointed out, we get a lot more back than we put in—as is usually the case with junior alliance partners. Australians are as fond of a good deal as anyone else. But one of the best questions to be raised throughout the week was how relevant the alliance is to today’s youth. It’s a good question because they don’t see the benefits as directly as their forebears did. Their grandparents (and increasingly their great grandparents) see the alliance through the eyes of people who saw the upheavals of WWII first hand, and understand in a visceral way the benefits of allied power when national security is threatened. Their parents don’t have that experience, but grew up in a world still heavily influenced by the outcomes of WWII (I still remember the schoolyard ditties about Hitler and company) and the vicissitudes of the Cold War. Despite the problematic Vietnam War and the very public push back against the alliance, the benefits of the alliance were real enough in the face of an enduring security concern to keep support levels high. In fact, the level of support for the alliance remained above 80% even as Australian forces were about to leave Vietnam. This chart (click to enlarge) shows the level of support for the alliance, culled from a variety of sources. Because the questions asked differ, they aren’t completely compatible data sets, but the picture is remarkably consistent. 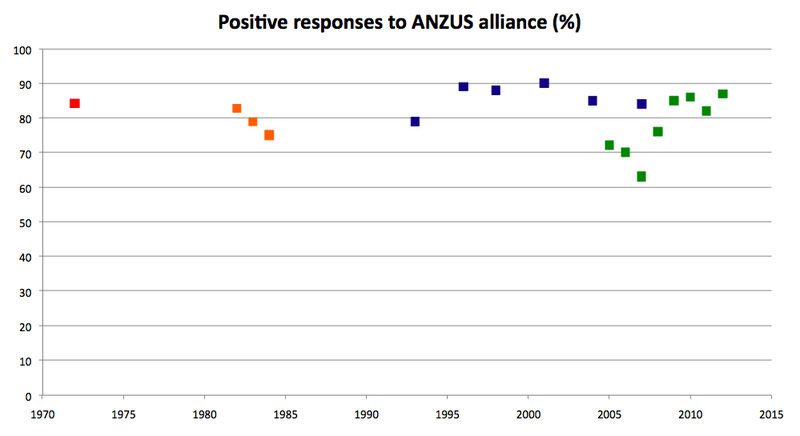 From the 1970s onwards (and there’s no reason to think it was different earlier), a large majority of Australians have attached a high value to the alliance. Australians 18 to 29 years old are the least likely age group to say the alliance relationship is ‘very important’ (43%), while those 60 and older are the most likely (71%). That’s not surprising. For someone who is 20 today, the Cold War and World War II are ancient history, best known through movies and TV series (downloaded ‘for free’ from the net, of course). Their ideas of security are coloured much more by childhood memories of the 9/11 attacks and their perceptions of the wars that followed—and that’s not a great basis for understanding the benefits of alliance. Lowy’s poll this year asked people to evaluate the worth of the Iraq War and the results were clear—38% thought Australia’s involvement was worthwhile, while 59% gave it the thumbs down. The same poll showed that only a third of Australians support our ongoing commitment in Afghanistan (and probably fewer still younger people). Together, these recent wars are a significant weight in the alliance’s saddlebags. However, the effect might not last—the eight years of Lowy poll data from 2005–2012 seems to show a dip in alliance support immediately after the Iraq War of 2003 (well down from the halcyon days of the 1990s), but also shows a recovery of support to historical levels with the passing of time. There’s no reason to expect support for the alliance to collapse precipitously, but the future trend could easily prove to be downwards. That said, I think there are reasons to think that the ANZUS alliance will continue to appeal to Australians. And it’s not because young people are going to sit around listening to older family members reminiscing like British comedy’s old Yorkshiremen  about how hard things were when we were young. Firstly, young people get old, and tend to become more conservative as they do so, which might help keep support levels high. But if there’s a need for marketing in the future, it might be worth remembering that today’s youth were ‘born digital’. They’re immersed in American popular culture on an almost continuous basis through the digital tools they’ve grown up with. And that’s probably where those interested in pitching the values of the alliance need to be looking.